Flax might be one of the most important sprouts for health, as it contains six essential ingredients that are commonly missing from the modern diet. It is unparalleled as a source of essential fatty acids, both kinds of dietary fiber, anti-oxidant lignans, and is an easily-assimilable complete protein. And of course, enzymes when sprouted. It’s also surpassingly easy to sprout and tastes wonderful. Everyone should should slowly build up to eating a few tablespoons once or twice every day. The protein in flax seeds is easily digested and contains all the amino acids needed for building and maintaining a strong body. Flax’s insoluble fiber comes from the shell acts like a broom, sweeping the colon of toxic material, impacted waste and dried mucus. Flax fiber is excellent nourishment for friendly bacteria in the intestine, which keep disease-causing organisms in check. Twelve percent of flax seeds is mucilage which makes it a gentle, non-irritating, natural laxative. Flax mucilage is perfect for those who have a sensitive stomach, acting as a buffer for excess stomach acids, soothing ulcers or irritable bowel disorders. Dry flax absorbs 20 times its volume in water and can seriously dehydrate a person and become lodged in the colon; sprouting flaxseeds is the best way to enjoy its host of benefits. Flax is available in two varieties: brown, which is higher in omega-3s and has a harder shell, and golden, which is softer and has a sweeter and milder flavor. If you don’t have a high-speed blender, use the golden seeds, because the brown need to be pretty well pulverized, otherwise they can pass through the digestive system intact. In low-temp baking, the mucilaginous aspect of flax makes it a great substitute for sticky gluten in sprouted loaves. Lightly sprouted ground flax seeds make a light and creamy, mild flavored bread with a spongy quality which makes living tortillas or elastic Ethiopian Injera bread possible. Add a little or a lot of sprouted Kamut or spelt for a more sticky and dense loaf, which will require several times longer to cook. Include some to the pulp leftover from juicing and dehydrate it to make crackers, or add it to young coconut meat to make flexible, thin wraps more pliable than tortillas and nori. Essential fatty acids, or EFAs, carry a slightly negative charge and spread out as a thin, even layer over surfaces. This makes cell membranes soft, fluid and flexible, allowing nutrients to flow in and wastes out. EFAs produce detectable bioelectrical currents, which make possible the vast number of chemical reactions in the body like nerve, muscle and membrane function. This living current is also a measurable difference between alive and dead tissue, and fact of interest in many fields of study, I would think. EFAs absorb sunlight and attract oxygen; a plentiful supply of oxygen, carried by blood to our cells is fundamental for vitality, pain relief and healing - EFAs are able to hold onto this oxygen at the cells’ boundaries, making a barrier against viruses and bacteria. Beneficial bacteria are great in our digestive systems, which aren’t really considered to be inside our bodies, because they’re not sterile - we don’t want any bacteria crossing into our blood or cells, and because EFAs help prevent that they are vital for our immune systems. Because fats are the second most abundant substance in the body (water is first), high-quality EFAs are also important in countless and varied metabolic reactions in the body like fat burning, food absorption, mental health and growth , making them especially important for children. They can substantially shorten the time required for recovery of fatigued muscles after exercise or physical work. Eczema is a severe allergic inflammation, and through their partnership with oxygen, EFAs scavenge allergens from the blood, decreasing inflammation and bringing suppleness and a youthful appearance to the skin. Modern medicine is discovering more and more than many modern health problems are the result of inflammation, so an anti-inflammatory diet with plenty of EFAs is essential for health, especially as we age. The absorption of sunlight is a curse, however, when the EFA is outside of the living seed. LNA (Alpha Linolenic Acid, an omega-3 EFA), for example, is about five times more reactive to light than LA (Linoleic Acid, an omega-6 EFA). Light increases LNA's ability to react with oxygen by a thousand times. The unsaturated fatty acids with more cis- bonds, like omega-3s, are extremely sensitive to light and will spoil rapidly when exposed to it. So the special nature of the EFAs that make them essential to life - the absorption of oxygen and transformation of solar energy - causes them to decompose when left exposed to air and light, like when seeds are ground and packaged as in the case of flours. When EFAs and their highly unsaturated long-chain fatty acid cousins are open to the elements, free radical reactions start to take place. Just one photon of light can start a destructive game of telephone, breaking bonds down the line until it peters out around the 30,000 mark. The incomplete molecules join together forming new and toxic compounds. Nature to the rescue: protection from these free-radical toxins is supplied by the fat-soluble vitamins such as A and E, which trap these light-caused chain reactions before they get out of control (and become denatured themselves). These powerful anti-oxidants are always found in concert with EFAs in whole seeds, the perfect container for what might be the body’s most vital nutrients. At best, the refining, bottling, cooking, shipping and storing of EFAs renders them unusable or non-existent, and they can quite easily become carcinogenic. By far the best way to include these vital nutrients in our diets is to sprout the troika of seeds high in EFAs: hemp, flax, and chia, which will offer them the 3-part protection of the seed’s shell, free-radical scavengers, and living tissues. It’s also (surprise, surprise) the cheapest way: 3 tablespoons of sprouted flaxseed contain 6 grams of omega-3s, the recommended daily allowance, for about 6 cents, in contrast to the 2 dollar shot of bottled EFAs from companies like Udo’s Choice and Barleans. Chia provides even more, and of course, both are whole seeds and therefore supply countless other benefits. All three kinds of EFAs (omegas 3, 6, and 9) are necessary, but special care must be taken to get enough 3. Omegas 6 is quite plentiful, available pretty much wherever fats are sold, and we need very little of omega 9, so unless you’re eating one bite of celery a day so you can be a prima ballerina, chances are you’re fine. But as important as EFAs are to health, the really important thing is the ratio of EFAs to each other. The optimal proportion of the 3 and 6 EFAs is 1 omega-3 to 4 omega-6s, 1:4, but the standard modern diet is more often a ratio of 1 to 20 or more. This imbalance causes the body to make fat-soluble hormones called prostaglandins to deal with the excess 6’s, wasting valuable globular proteins and essentially creating toxins out of unusable fats. Adult acne is usually created, or at least exacerbated, by this imbalance. This I know from experience, breaking out like crazy when I (as I slowly discovered) ate foods with an over-abundance of omega-6's, avocados and cashews especially. This is why I try to steer raw food chefs away from these ingredients, which seem to be in just about every dish on raw food menus - more like a crutch than an opportunity to feel amazing and alive. Cashews are in fact not raw, but more importantly have little nutritional benefit and a few major drawbacks, such as the toxins and allergens they contain. One of these, urushiol, is the same irritant found in poison ivy, a relative of cashews. Whenever you eat anything with an excess of omega-6 EFAs (also called oleic or linoleic acids), like cashews, peanuts, olives and oil, almonds, zucchini, or avocados, make sure to add some sprouted flax, chia, or hemp seed (or oil) to the meal to balance out the fats in a healthier ratio. Hi all, reformatting my book for hopefully the last time, and I thought some people might like to see the table of contents and get a little taste of what's in store in the (hopefully) not-so-distant future. Spacing is a little weird, sorry. Enjoy! Why Mess with a Perfectly Good Seed? Here's the recipe for these easy but kind of spectacular pops. 3 Components: banana ice cream, shell, and seeds. First sprout, season, and dry pumpkin seeds, then prep and freeze banana ice cream pops, last prep shell and assemble. Toss seeds with some salt, cayenne, and raw honey to taste. There are no amounts because we all have different preferences, needs, and constitutions. Taste as you go and have fun. Optional: Sprouting takes some the beautiful green away from pumpkin seeds. Add a pinch of green tea powder to bring it back (as I did in pics). Dry at less than 110º for a day. through with the ladle you're stirring it up. We want swirls, asymmetrical and organic. Mixture should be thick enough to hold up a popsicle handle, I used plastic spoons though popsicle sticks, clean and de-barked twigs, chopsticks, etc will work fine. Coconut oil can be liquefied by putting jar in a warm place, like on the fridge or dehydrator, or running under warm water until it melts. Blend all ingredients until shiny and consistent. Dip in cacao-coconut mixture and quickly roll in seeds. Put back in fridge for an hour, then transfer to gallon –sized zip-loc freezer bags. In the picture at the very top of this post, you can see one pop dipped completely, while the others have an open bottom. I think the first looks cleaner, and the others have a window into wabi-sabi. As always, your choice! Coconut oil is a liquid above 76º, and a solid below (everything has its own melting and boiling temperatures: candle wax, steel, the sun.) When liquid coco oil touches frozen banana, it turns back into a solid. Roll the pops in the pepitas quick before this happens. Chia is a super-easy sprouter. Just soak it in 4 times as much water for a day, then stick it in the fridge. Because of its slippery soluble fiber coating, it will germinate and sprout under water, just like flax and mustard. I always keep little jars of these three sprouted in the fridge. Chia is a small mucilage seeds from a desert plant closely related to mint, and are both black and white in color. In pre-Columbian times, chia was an important staple in both the Aztec and Mayan diets, and was the basic survival ration of Aztec warriors. It’s been said that one tablespoon of the seeds could sustain an ancient scout for a full 24 hours. Banned by the Spanish government in the 16th century after a millennium of cultivation because of its close ties to the Aztec religion, chia is currently experiencing a cultural renaissance, which I hope is due in some small part to their incredible nutrition and not entirely the result of chia-pets and -presidents. The highest plant source of Omega-3 EFAs (higher than even flax, but not quite as yummy), chia is rich in fiber (over 25%, in fact), has 3 times the antioxidants of blueberries, more calcium than milk, and more iron than spinach. Chia also contains high quantities of phosphorus, magnesium, manganese, copper, molybdenum, niacin, and zinc. The Aztecs used chia medicinally to relieve joint pain and sore skin, and I expect both of our cultures can respect the fact that it’s so high in anti-oxidants that it will stay fresh for years longer than most seeds, especially as ours deals with a peak oil crisis. As a mucilage, the gel that forms when put in water helps slow down the breakdown and metabolization of carbohydrates and sugar, so it’s the perfect thing to add to dessert to keep blood sugar from spiking. Now that modern society is noticing this mighty little seed again, it’s being fed to laying hens to increase the omega-3 in their eggs, and chickens and cattle to increase the nutritive value of their meat. If I had to pick an “Official Seed of Societal Collapse” this would be it. But it wasn’t until I was making my own near-daily conconction that the answer came in the form of aloe vera. This succulent that grows wild in many warmer-climate areas is an oft-mentioned sunburn remedy, but its benefits go far deeper. Literally: the skin-soothing qualities of aloe are nothing compared to its gut-lubricating and pacifying nature. It’s often recommended for its soothing benefits alone in the treatment of colitis, inflammation of the intestinal wall. Quite bitter, it’s right up there with black pepper, cardamom, cayenne pepper, cinnamon, fennel seeds and ginger in the ayurvedic list of herbs for increasing digestive metabolism. It also boosts the production of white blood cells and stimulates immunity, and it even improves joint flexibility. Aloe contains compounds called mucopolysaccharides which are the amino sugars needed for the regeneration of joint fluids and capsules. Not only does it regenerate and strengthen joints, because of its anti-inflammatory nature it also reduces joint swelling and pain. And not a minor detail: if you can find a plant (I brought a couple home from a trip to Southern California, $3 for 2 five-gallon plants on craigslist) to snip a few inches from daily, it quickly becomes free. Otherwise, the gel-filled leaves are available at natural and asian markets. My favorite way to enjoy aloe is blended with orange juice. Just peel a feel oranges and drop them in the blender with a few-inch piece of aloe. Blend it up and enjoy. Including the white pith makes full use of the ample soluble fiber in citrus and adds a lovely foam to the drink. Including the seeds adds another digestive-fire benefiting aspect which becomes obvious if you let it sit for half an hour or so. Citrus seeds are anti-microbial, anti-fungal, and anti-viral; great for giving parasites and candida the boot. They're are available as expensive extracts to treat these and other issues. They're also extremely bitter, simultaneously increasing digestive potency while affording the above-mentioned benefits. But when we blend peeled oranges or other citrus with the seeds, the bitter qualities of the seed don’t start to leech into the juice for 30 minutes or so. This means that you can enjoy a sweet and delicious drink and the bitter won’t come out until it’s already past your taste buds, offering full access to the benefits without any of the less-than-enjoyable taste. 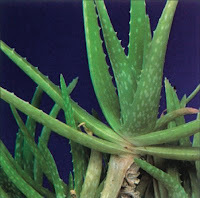 Take your aloe from the lower leaves, and slice of the spiny edges. Fillet the skin away from the gel inside with a long, sharp knife, making sure to rub the medicinal insides on your face, scalp, body, and pets. Aloe gel has been used to treat all manner of skin issues like hives, cuts, rashes, boils, acne, eczema, and psoriasis (showing a 75% reduction in clinical trials). There will be a straight peel and a curved peel, the first is much easier to skin off and personally, I don’t even bother cutting off the second. Enjoy your aloe and let me know how it goes.